A loan to a family member or a friend is usually unsecured. The terms and conditions are undefined or hazy and demanding payback is difficult. And if the loan goes bad, the relationship also sours. Moreover, such a loan is usually interest-free. Make sure lending to a family member does not become a headache. "Neither a borrower nor a lender be; for loan oft loses both itself and friend." The advice by Polonius, the chief counsellor to King Claudius in Hamlet, had good reasoning behind it. A loan to a family member or a friend is usually unsecured. The terms and conditions are undefined or hazy and demanding payback is difficult. And if the loan goes bad, the relationship also sours. Moreover, such a loan is usually interest-free. This means you lose money. So, most people flinch from giving financial help to their close ones. But what if you draw up a legal document clearly defining the terms and conditions of the loan? This way you can help your friend as well as protect your interests . There are two ways to do this - a promissory note and a detailed loan agreement . "A promissory note is an acknowledgement to pay back debt (on demand or otherwise) and may include some simple terms and conditions. If the aim is to include specific or detailed clauses, it is advisable to enter into a loan agreement," says Gurmeet Singh Kainth, partner, D H Law Associates, a legal firm based in Mumbai. 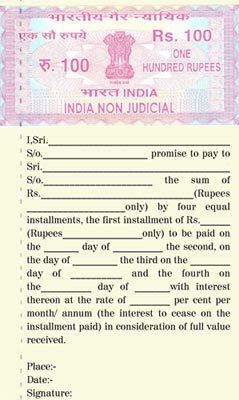 Both are legally valid documents and are accepted by courts in case there's a dispute. If you want to keep it simple and only for the record, go for a promissory note, an unconditional promise by the borrower to pay a fixed sum on demand or at a specified date. This instrument comes under Section 4 of the Negotiable Instruments Act, 1881, and has to be signed by the borrower. It is of different types-single/joint borrowers, payable on demand, payable in instalments or as lump sum, interest-bearing and interest-free. Though the basic format is the same, a few sentences are added or tweaked to change the terms and conditions. A simple Google search will give you sample formats. Though not mandatory, it's better to draw the note on a stamp paper and get it notarised. Any notary (special judicial officer) will attest it for a small fee. Loan documents, however, have to be drawn on a stamp paper and notarised. They let you put as many clauses as you want, such as on collateral, default, termination and inclusion of legal heirs. Be careful about the wording. Use full names (as they appear in identity proofs such as PAN/voter I-cards) and mention the date and place clearly. Points such as tenure, periodicity (monthly, annually, lump sum or in instalments) of payments and how the interest will be calculated (simple, compounded annually, etc) should be phrased clearly. Carry out the transaction through a bank cheque and mention the cheque number in the agreement. Unlike a promissory note, a loan agreement can be modified. An amendment clause needs to be incorporated in the agreement. It enables the parties to amend the document on mutually-agreed terms and conditions. "Amendments can be carried out either through written confirmation or a supplementary agreement," says Kainth of D H Law Associates. There is no legal requirement but it is advisable to get the document signed by a witness, preferably someone not related to any of the two parties. This will hold weight if there's a dispute. Gifts from family members are not taxable, neither are the loans. But any gift above Rs 50,000 from a friend (non-relative or anyone who falls outside the definition of 'family' under the Income Tax Act) during a financial year is taxable. However, if it's a loan (with or without interest), it becomes tax-free. So, if your friend gifts you Rs 60,000, you have to pay tax on the amount, but if it is a loan that you will be paying back, there will be no tax on it. Interest-free loans are non-taxable for both lenders and borrowers. However, it becomes complicated in case there is a provision for payment of interest, as the lender will have to pay tax on the interest earned. "Whether the borrower has to pay tax on the interest paid depends on the purpose of the loan. While, say, a loan taken to buy a house will be eligible for tax deduction under Section 24, you won't get any tax benefit if the money is for personal use," says Kuldip Kumar, executive director, tax and regulatory services, PricewaterhouseCoopers India. Also, non-institutional loans (from private individuals, including friends and family members) are not eligible for tax deduction under Section 80C. That is, you will not be able to claim tax deduction on the principal. But then, unlike a friend, a bank will never lend you without interest or at a discount.